NOTE: The feeding of ANY wildlife, including birds, is prohibited. Based on the history of building damage and potential health and safety issues a $50.00 immediate fine will be assessed to anyone feeding wildlife in the community, effective starting July 1, 2011. Per Section 6.4 of the Bylaws. 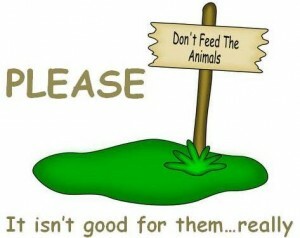 There are many reasons for this including that its simply best for the animals. a) When animals become dependent upon us, they loose their natural foraging skills. What happens when you are on vacation, ill or move to a new home? b) Animals loose their natural fear of people, which can result in unfortunate encounters for either the animals or people. Animals do not discriminate between one person or another, hence while you might appreciate the animals, they can be a pest for your neighbors. c) A constant source of human provided food can attract more wildlife to the area than is healthy for the animals, resulting in territorial issues and the spread of diseases among populations living too close together. The best thing you can do to care for the wild animals on your property is to give them habitat, not handouts. Providing natural sources of food is a great way to provide the animals with food and shelter that will not put them in danger the way a human-provided food source will. You will still be able to enjoy wildlife on your property, but at a safe distance for both you and the animals. Those natural sources of food, such as shrubs, plants and trees which support wildlife can be readily found on the internet.